A new set of leaks on Intel’s upcoming Skylake purports to lay out how the chip’s will be positioned and what features they’ll offer. If the data is correct, Skylake will continue scaling up Intel’s graphics cores, set new records for “big core” x86 power consumption, and offer DDR4 support, as well as copying a page from AMD’s book and shipping a configurable TDP. Skylake is set to be a major update on the CPU side too the core will reportedly integrate a new instruction set (AVX3) as well as PCIe 4.0 on the high-end Skylake-E, Thunderbolt 3.0, and new security extensions. Intel also wants to move towards a cable-less future with this new chip, though whether that takes off is anyone’s guess. If WCCFTech’s data is accurate, Intel will launch multiple Skylake flavors, including SKL-Y (embedded and ultra-mobile dual-core with a 4W TDP, LPDDR3 support, and GT2 graphics), SKL-U (dual-core, 15-28W TDP, 64MB of L4 cache, LPDDR3-1600), SKL-H (quad-core, 35-45W TDP, 128MB L4, DDR4-2133), and SKL-S (quad-core, 35W-95W TDP, 64MB L4, support for multiple types of DDR3 and DDR4, and multiple graphics engines ranging from GT2 to a new GT4e. We can’t draw many conclusions from the graphics engines themselves; Intel tends to keep the same labels while increasing the relative horsepower. The HD 4000 and HT 4600 are both referred as “GT2″ solutions in Intel’s nomenclature, even though the two chips have different performance capabilities and feature sets. Broadwell is supposed to deliver a major update to Intel’s graphics engine and the company’s performance has been increasing with every product line we don’t know yet if Skylake will continue this trend, but Intel’s decision to include a smaller version of its EDRAM cache on more processors also jives with what we’ve heard about Broadwell. 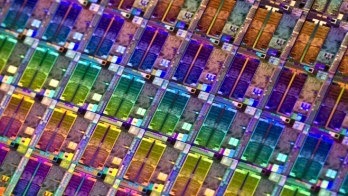 The launch of a dual-core 4W part, if the company can pull it off, would be a major coup for Intel’s big-core business. Right now, Bay Trail and Haswell remain separated by a sizable TDP gap Intel’s 11.5W Haswell is a dual-core/quad-thread CPU with a 6W Scenario Design Power (SDP) and a 1.7GHz base clock/2.9GHz Turbo. Its fastest Bay Trail is a quad-core with a 1.6GHz base clock, 2.4GHz Turbo, and a 2W SDP but an 11W TDP. If Intel can actually push down to a 4W TDP, it means the SDP of a 2016 Skylake and a 2014 Bay Trail are likely identical. It’s difficult to predict how much performance changes that’s going to be workload dependent, and hinge on factors like cache efficiency, length of time spent in turbo, and architecture but it’s going to give Intel a fighting chance to put Skylake in the same form factors and battery lifespans where Bay Trail excels. As for when the chip will launch, Skylake was originally supposed to drop in 2015, but that was before the Broadwell delay. Private sources have indicated that the 14nm Broadwell pushback will have trickle-down effects across Intel’s product lines, meaning that launches that were originally supposed to happen in early 2015 will be delayed to later in the year, while late 2015 launches will likely slip into 2016. 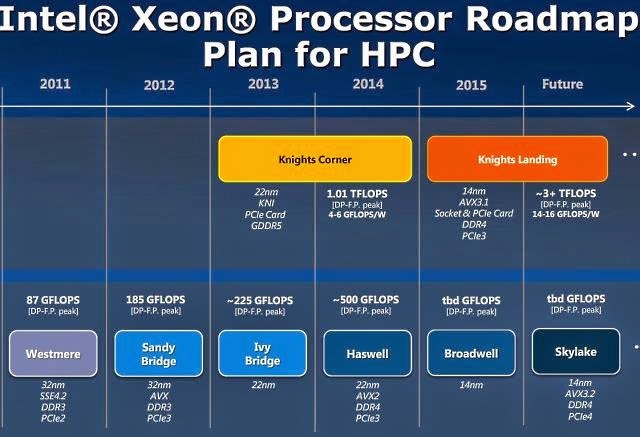 Intel’s own Xeon roadmaps may have tacitly confirmed this, though the Xeon roadmap can also lag behind the desktop. Intel’s first Haswell-based Xeon E3 CPUs arrived shortly after the chip’s desktop introduction, but its E5 and E7 chips are still based on Ivy Bridge more than a year after Haswell launched. Finally, as far as DDR4 is concerned, the chips will top out DDR4-2133 and will only officially support DDR3-1600. If that’s true, it implies Intel is fudging configurations a bit to compensate for DDR4-2133′s higher latency at the same clock speed, DDR3 is faster than DDR4 thanks to its intrinsically lower latency. DDR4 won’t pull ahead from DDR3 until it hits at least DDR4-2700 and I wouldn’t expect to see significant improvement until DDR4-3200. AVX3 should provide significant acceleration AVX2 gave Intel chips a hefty kick over standard AVX but its aimed at the same HPC markets where Xeon Phi has done well. The impact on consumer software may be minimal, at least in the near term.